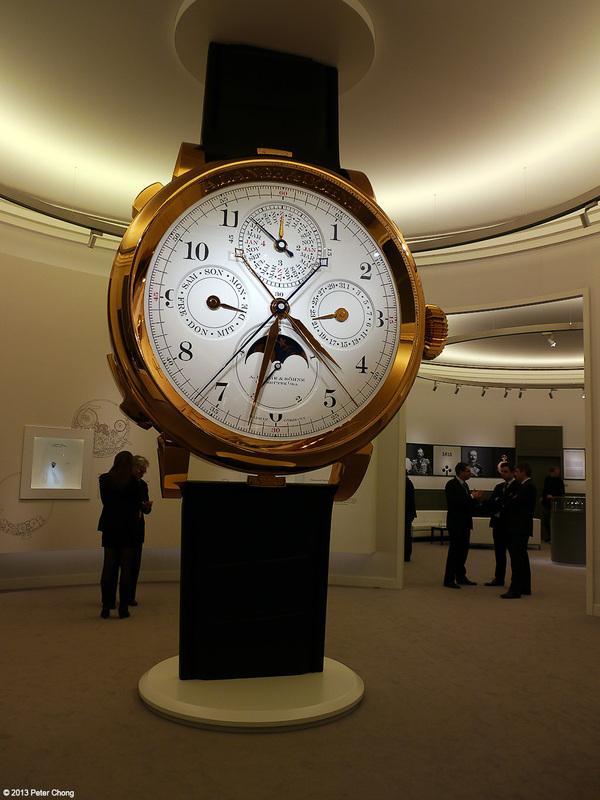 The iconic piece Lange showed this SIHH2013 is the Grande Complication. Modelled after and inspired by the 42500 Grande Complication Pocket watch, this magnificent piece is the lastest salvo fired by the little manufacture in Glashutte. 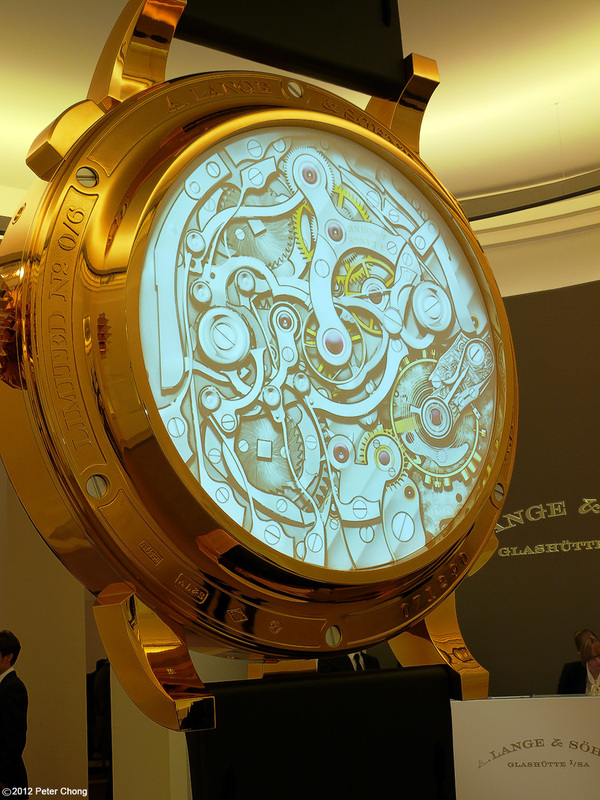 The giant model of the Grand Complication which greets visitors to the Lange booth. The model displays the correct time, and even strikes en passant, though the sound of the strikes are recorded from an old pocket watch rather than the actual Grande Complication. The recorded watch exhibits a rather loud buzzing governer, while the actual GC is rather quiet. A Grand Complication...typically this is a concoction of 4 or more complications...in the case of the Lange GC, its 7...pepetual calendar, chronograph, split seconds, fourdroyante, minute repeater, petite sonnerie, grande sonnerie. Quite a long list. All this packed in a case 50mm in diameter, some 20.3mm in height...I did not get to try it...afterall, Lange had intended this to be a teaser...a watch as significant as this should not be announced and showed in a crowded show like SIHH. It deserves total and global press and collector attention with its own show. The giant model of the Grand Complication, movement side. Here a projected image, likely computer generated shows a small video introducing the GC. 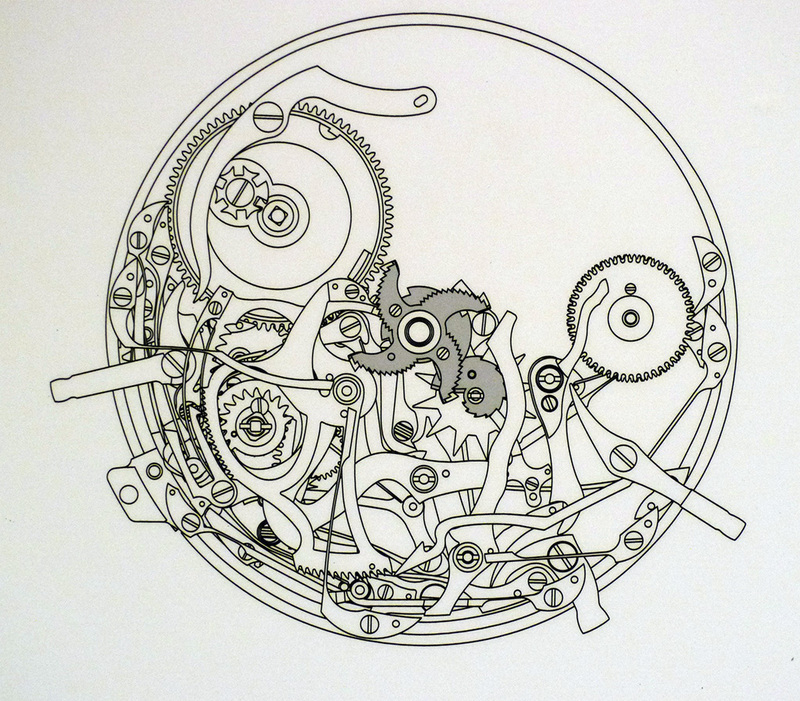 The movement looks deliciously complicated. As such, though there was a working prototype, and because there was only one, Lange took the decision to only show to selected press and customers, and declined photography and handling of this fine watch. 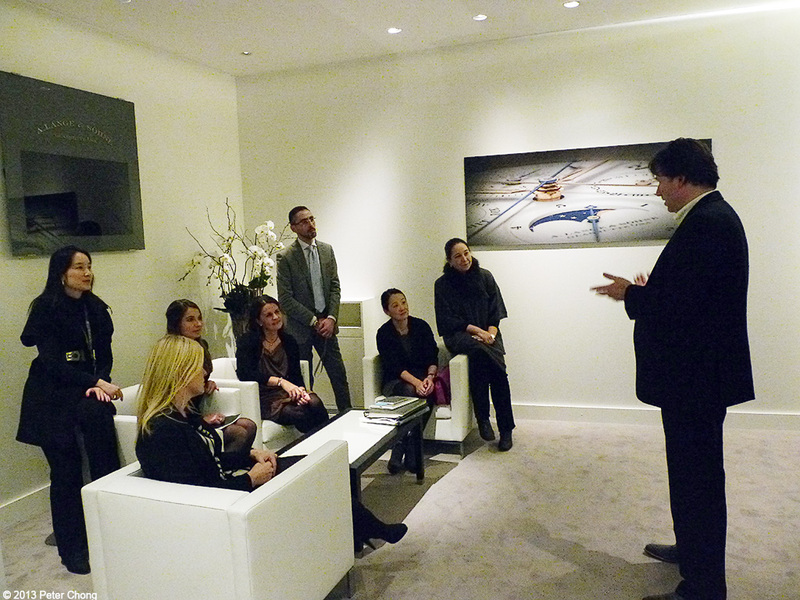 Tony briefing the brand managers and showing them (and me) the watch. We listened intently to the striking. Loud, crisp, beautiful tone, nice resonance. Very quiet regulator sound. In a word, magnificent and beautiful. So why is this significant? 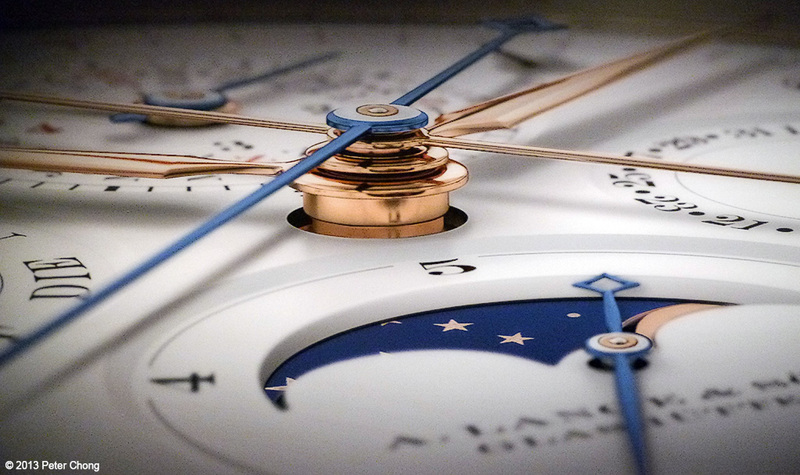 Well, it is possibly the first grande complication to be manufactured in Glashutte. The older pocket watches were all built in Glashutte from base ebauches which were Swiss made. Indeed the venerable 42500 was probably a Piguet base movement, though many of the complications were added in Germany. 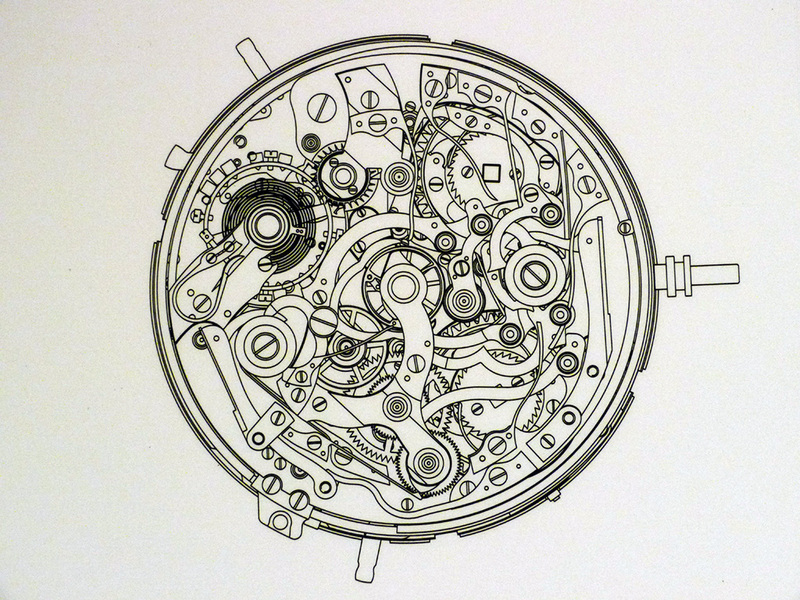 Drawing to explain the workings of the watch. Second, it was the only Grande and Petite Sonnerie amongst the top tear manufacturers with the exception of Audemars Piguet and Franck Muller. Patek Philippe does not offer one, and neither does Vacheron Constantin. The heritage of the wrist watch Grande Sonnerie traces back to Grandmaster Philippe Dufour, who shocked the horology world with the first Grande et Petite Sonnerie wristwatch. He made a total of 6, and in a conversation I had with him in Geneva, he just completed...or about to complete no 7. The Grande and Petite Sonnerie in a wristwatch is rarified territory, but when you add the other complications...well it becomes almost unique. Picture of a photograph or computer generated graphic hanging on the wall of the GC room. Other specialities? The dial is a multi piece enamel dial...made in Glashutte. The works were completed by now Master enameler Romy Zimmerman...a young lady, I first met when she was an apprentice experimenting with enamel in the engraving department many years ago. The dial is magnificent. 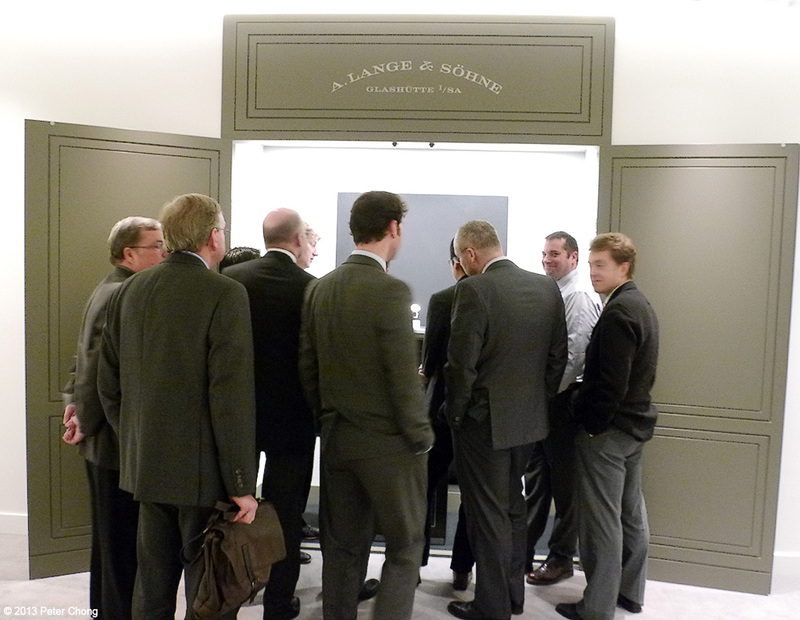 Showing the select Lange Owners Group the GC...if you look close enough, the watch is right in the center. The group was impressed with the visual impact of the GC and the sonics. It will take one full year to manufacture one of these complicated beauties. So only 6 will be offered worldwide. Delivery is expected from 2014 to 2020. The price...a cool €1.95 million German retail. You'd think it will be difficult to sell such an expensive watch, but I personally know of at least 2 persons who are in contention to get one, and Wilhelm Schmidt, CEO of Lange told me they have serious enquires numbering upwards of a dozen. Drawing showing the striking works. Completely new design from ground up.